The throttle control was too close to the prop control. 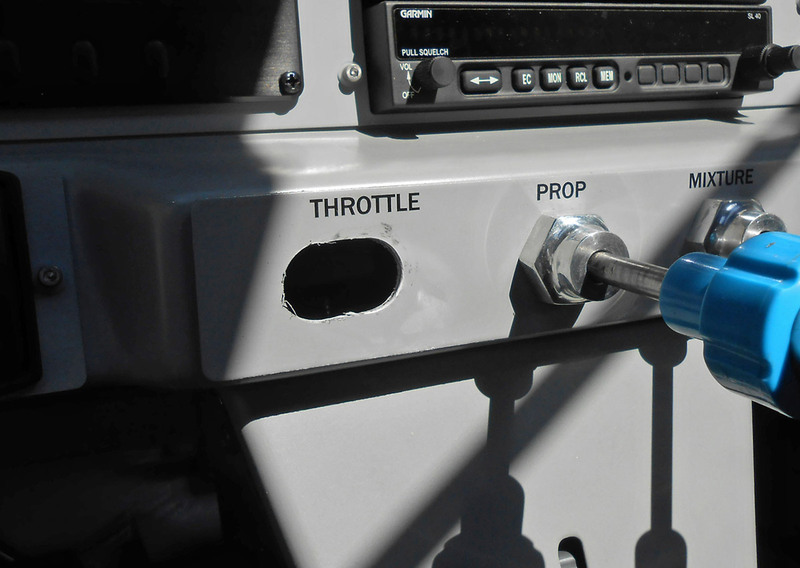 My knuckles would bump and scrape the prop vernier knob as I would add or decrease throttle. After only 82 hours, the ACS throttle was getting sticky and difficult to operate quickly if needed. At AirVenture this year, Sportsman owner Ray Chaput told me about McFarlane Vernier Assist Throttle Controls. I was ready to quit a vernier throttle and go back to a non-vernier style, but Ray told me the McFarlane vernier assist design was the best of both worlds. I took a short break and visited with Star Novak at the McFarlane booth and was very impressed with the throttle control. It was smooth to operate with very low friction. Best of all, one could make fine adjustments by twisting the knob in vernier fashion, but there was no button to push to release the vernier adjust. Just pushing the knob like a non-vernier control resulted in instant cable actuation (throttle response). Like Ray, I couldn’t resist and had to give it a try. 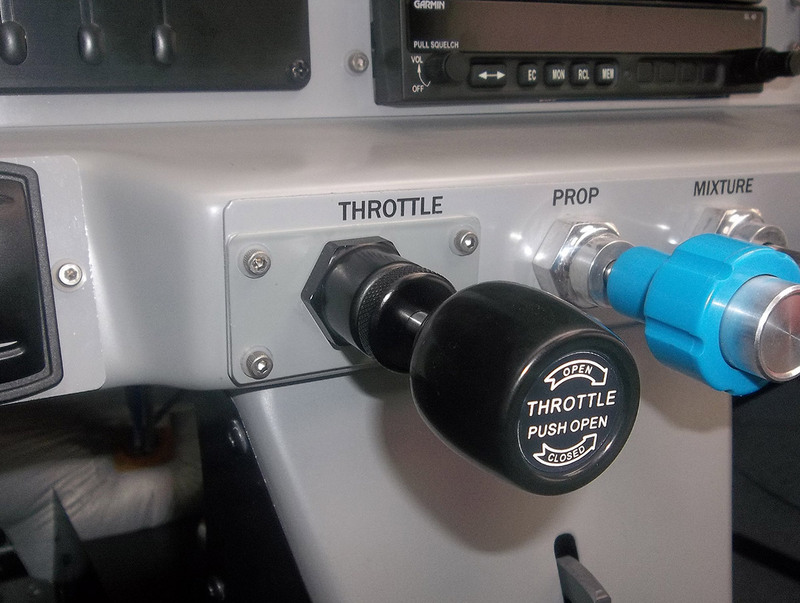 Returning from AirVenture after piling up another 40 hours on N11YM convinced me the throttle control would be a big benefit especially when I go play in the bush with a death-grip on the throttle. Removing the ACS cable was easy once I loosened up the fire barrier caulk at the firewall pass-through fitting. Creating a small rectangular cover plate easily hid the oblong hole and doesn’t look too much like a patch. I ordered a Standard Type Vernier-Assist 48” cable length which McFarlane stocks on the shelf. Non-standard lengths are also available on special order. While installing the new cable control, I moved the mounting hole 3/4” farther away from the prop vernier which was enough to save my knuckles from further abuse. Creating a small rectangular cover plate easily hid the oblong hole and doesn’t look too much like a patch. I took several photos of a special tool we created here at the Customer Assembly Center to aid in the securing of the jam-nut against the backside of the instrument panel. Simply go to the nearest cheap tool outlet and purchase a 1” box-end wrench or socket and tack-weld it to a length of tube as shown. Cut a slot wide enough to allow the cable to slide inside and the job of tightening down the jam-nut gets infinitely easier. 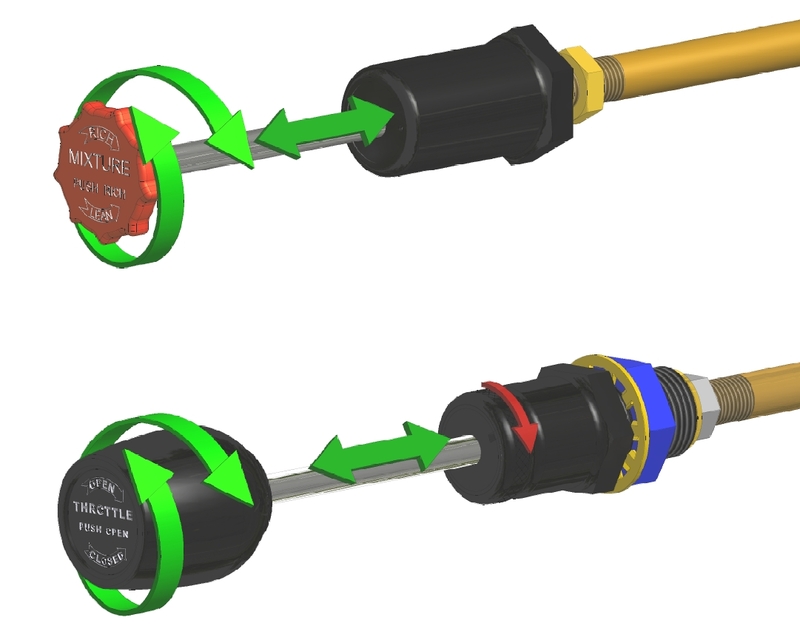 This special tool makes installation much easier. The end result is that I absolutely made the right decision and LOVE the new throttle. It was worth every penny and further reinforces the age-old adage; “you get what you pay for…” Congratulations to the engineers at McFarlane for a great product. The guts of the vernier assist control are an engineering wonder. Yes, I wish I had McFarlane controls for the prop and mixture as well, but since these are used much less than throttle I will tolerate them for now as I am spending all my spare dollars on Avgas. All of the ACS vernier controls use 1.0” jam nuts. The ACS non-vernier controls use 3/4” jam nuts and the smaller inner-wire style for carb and cabin heat control use 9/16 nuts. So, I fabricated tools for all three sizes for use in the Glasair Customer Assistance Center. I’m not sure about other brands of engine control cables. These are the only ones we have experience with. To install the new McFarlane vernier assist cable I used the 1” tool. For more information, contact McFarlane Aviation Products 800-544-8594 or visit www.mcfarlaneaviation.com. Born Wichita Kansas Oct 02, 1953. (have a fascination with tornadoes) Private pilot SEL & Sea approx 3,000 hrs Co-founder of Stoddard-Hamilton Aircraft in 1979. Contributed developmentally toward all models of the Glasair, GlaStar and Sportsman in from 79' thru Oct. 2016 when I retired. Whew...38 years! Started construction of my own custom, lightweight Sportsman in 1999 from the basic kit. First flight of N11YM was Jan 2013. I love this plane and have tested three variations of taildragger main landing gear. Recently purchased a set of Clamar amphibious floats and can't wait to install them hopefully in 2018.